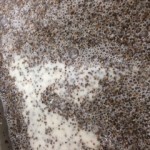 Chia seeds have become a popular “superfood” nowadays. Have you tried it before? 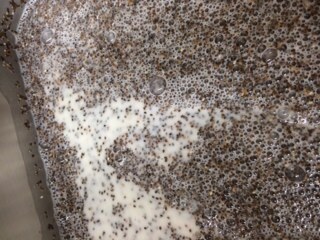 The appearance of chia seeds is similar to that of poppy seeds. They are tiny black seeds. It’s commonly used as toppings in smoothies, salad, yogurt and desserts! 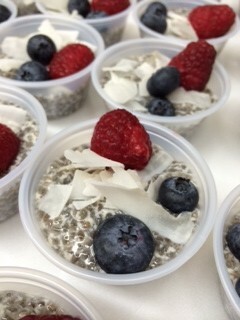 Chia seeds are good source of fiber, omega 3 fatty acids, calcium, phosphorus and manganese. They are low in cholesterol and sodium. 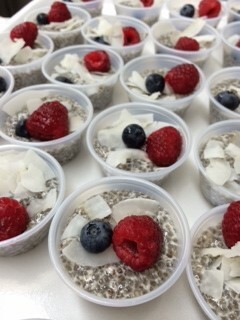 A tablespoon (12g) of chia seeds provides 5g of fiber, which meets about 20% of your daily fiber intake recommendation. It also provides about 2500mg omega 3 fatty acids, which is more than what a serving of the commercial omega 3 supplement provides. With all the goodies, a tablespoon is only about 60 calories. 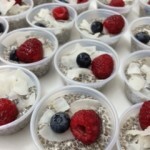 Compare to flaxseeds, chia seeds provides more fiber and calcium. However, flaxseeds do have similar amount of omega 3 fatty acids, protein and calories. 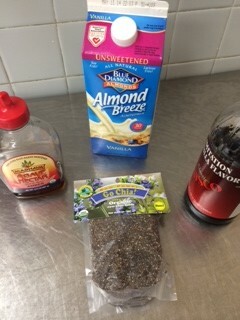 In a medium bowl, mix soymilk, honey and vanilla, then stir in chia seeds until combine. Refrigerate overnight. When ready to serve, stir well. Spoon into bowls and top with fruits and coconut. This dessert is great for parties and events! 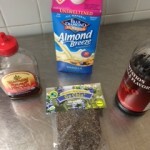 Quick, healthy and delicious!!! Enjoy!